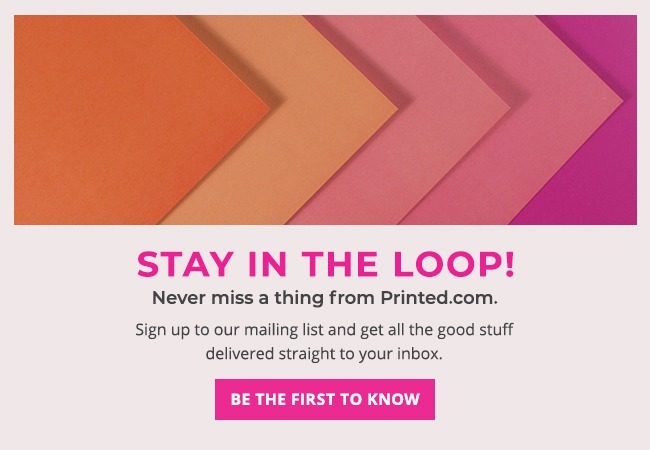 With so many papers to choose from at Printed.com, we want to help you choose the perfect partner for your print – so we’re taking an in depth look at some of our most loved papers. This week, we’re shining the spotlight on lovely Laid! A deluxe, tactile paper with a fine-lined texture on both sides, Laid is bright white for sharp colours, but uncoated for a soft, touchable finish. It’s ideal for anything that needs a dash of textured luxury, like Invitations, Cards and special Postcards. Why choose a textured paper like Laid? From the simplest typographic designs to the most intricate, adding a subtle texture can make all the difference. Not only will you be adding a touchable quality to your print, the raised and tactile surface of textured papers gives your designs extra depth, creating interesting prints that everyone will want to take a closer look at. Vintage designs love textured paper. Textured paper brings us back to an era of old world luxury, evoking memories of personalised hand penned letters and carefully crafted designs, perfect for those extra special sentiments, or bringing that vintage handmade feel to clean and simple designs too. Watercolour, illustrative and calligraphic designs love textured paper. It removes the ‘mass made’ feel that shop bought Greeting Cards and stationery can convey and evokes feelings of handmade craft. If you’re thinking about textured Business Stationery, it’s a subtle reminder that every tiny detail has been thought about – right down to the paper you print on! The paper you print on can really uplift and transcend your design, so have a think about the ways in which you employ this trend. Consider making the paper the star of the show with interesting textures. Just remember that the texture you choose will impact the way your print looks as a finished piece. Textured papers are uncoated, so your colours will appear flatter and slightly muted. While you’re here, why not check out some more customer creations? Just click here for an abundance of inspiration! Definitely one of my favourite choices for wedding stationery, I always recommend it!